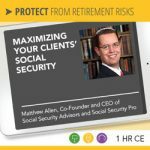 Matthew Allen is the Co-Founder/CEO of Social Security Advisors and creator of the new course Maximizing Your Social Security produced in conjunction with Weiss Educational Services. Having performed countless hours of client-focused research, Matthew applies this powerful knowledge and expertise by bringing insightful product vision, finance, and leadership skills to Social Security Advisors. In addition to co-founding Social Security Advisors, Matthew also founded The Universal Group of Companies, a private investment firm, in 2004. From 2000 to 2004, Matthew was a NYSE Market Maker with LaBranche & Co., a Fortune 500 New York Stock Exchange firm. During his tenure, Matthew was responsible for a variety of collaborative responsibilities including: investment analysis, economic analysis, and equities and fixed-income trading. In conjunction with his associates at LaBranche, Matthew actively participated as a market maker in several of the largest NYSE-listed equity and fixed-income securities including, but not limited to: American Express, Inc., Merck & Co., Inc., Altria Group, Inc., Morgan Stanley, The Gap Inc., and SBC Communications, Inc.
Matthew is an established speaker on Social Security topics, including how to maximize your clients’ Social Security. As a serial entrepreneur who is driven by a passion for providing industry-leading advice to his clients, Matthew Allen has been at the forefront of financial services for over a decade. He has helped thousands of seniors maximize their Social Security benefits and avoid costly mistakes when filing. In working with his clients, he realized that there was a major education and advice gap when it came to Social Security and was determined to fill this void by co-founding Social Security Advisors. Matthew has pursued advanced education in the areas of business, finance, law, and politics and has held the Series 65, Series 25, and Series 21 licenses and certifications, and has been awarded the CFA Institute’s Certificate of Achievement. Have Matthew Allen speak at your event! Matthew Allen is an experienced speaker and presenter with a passion for providing industry-leading information to audiences. Matthew is available to speak at your retirement meeting, conference or event. Inquire here about having Matthew Allen speak at your conference or event! Learn more about all Retirement Speakers Bureau presenters to find the one that’s best for your event. With over 10,000 baby boomers claiming their Social Security each day for the next twenty years, you are going to receive many Social Security questions. The average couple receives over $1 million in lifetime Social Security benefits, so for many of your clients, this will be a critical component of their overall financial and retirement planning. In addition to adding value by helping your existing clients make an informed Social Security decision, knowledge of Social Security can also be helpful to your overall practice and is a great lead generator. For more on this subject by Matthew Allen you may take this course for CFP®, CRC&reg, ASPPA, American College, and other continuing education credits here. Visit Retirement Insight and Trends, InFRE’s quarterly newsletter for retirement professionals, for a summary article of this 2017 presentation. William Meyer, CEO, Retiree, Inc. and Social Security Solutions, Inc.
To inquire about any speaker or presenter, click here to let us know some general information about your group, event, interests, and timeframe. Be the first to know about new retirement speakers! The best conferences have the best speakers. Click here to be sure you’re in the know about the new and featured retirement presenters as they are added to the Retirement Speakers Bureau. Know which speaker you want? Do you know which speaker(s) you prefer? Click here to inquire about scheduling the presenter(s) you want today! Don't wait to book your speaker! Click the button to the right to inquire about availability today. 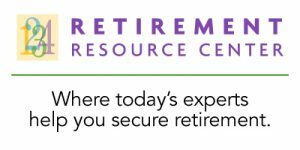 The Retirement Resource Center features live webinars and online courses from many of the presenters featured on the Retirement Speakers Bureau. Welcome to the Retirement Speakers Bureau! Copyright © 2018 Your Company Name. All rights reserved.